Making Rivendell in the Desert: Arwen Angel Dress Planning (Part 1): Debut of "Everyday Lord of the Rings Clothes: Epic and Wearable"
Arwen Angel Dress Planning (Part 1): Debut of "Everyday Lord of the Rings Clothes: Epic and Wearable"
This post is about my dress plans inspired from this dress that Arwen wears in Frodo's half-vision of her, when she finds them after he's been wounded. I know it should be Glorfindel. But the dress is still pretty. 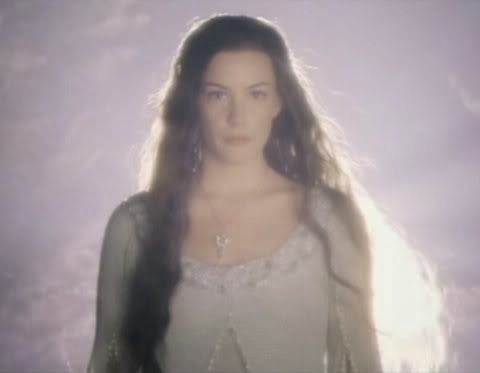 It has been dubbed "Arwen's Angel Dress" by fans. I love the dresses in the Lord of the Rings movies. 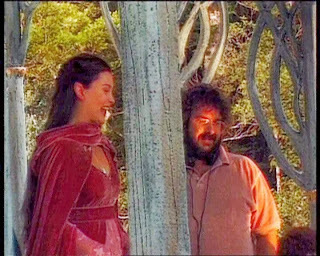 In the "making of" extras, and the "Art of Lord of the Rings" books, as well as interviews etc, you see how much craft went into the outfits. They emblazoned emblems of the 7 tiers of Minas Tirith on Faramir's buckle straps, even though you never see it, because, as a son of the steward of Gondor, its the kind of thing he would have. Aragorn's leather jerkin is torn, gouged, etc in many places, with crude repair jobs that suggest he fixed it on his own by a campfire. His shirt has fine embroidery on it, like it was a gift from the elves, though then it was so faded and worn that you can barely tell. Denethor is wearing AN ENTIRE SUIT OF CHAIN MAILLE underneath his robes, because he's a warrior underneath, even though you never see it. It was seeing the jerkins and the clothes, and how they were planned and weathered that gave me new respect for costume (or "outfit") makers. It was another way of telling a story. But with tears and sun-fading and sword cuts patched up with crude stitches instead of words. See the beautiful embroidery/beading around the neck. 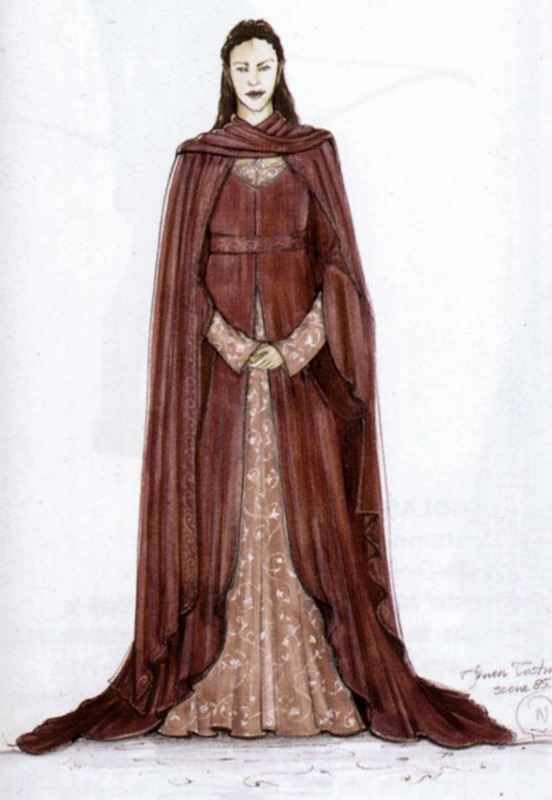 Ironically (given the real topic of this post) the elves clothing is my least favorite of all the costume design. 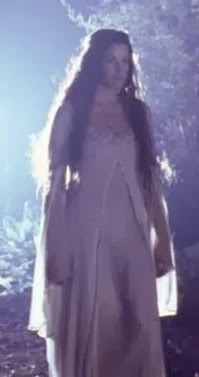 I just cant' see Tolkien's elves, especially his men elves, like Elrond, trailing around their courtyards in huge velvet bathrobes whose sleeves drag down on the ground. The elves climbed trees. And sang silly songs at the dwarves. They were also sad, and grave, and deep. I get that. But I think they would wear clothes that they could move in, climb trees in, swing between branches stringing lanterns in. 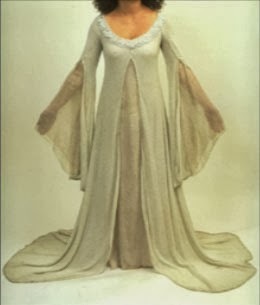 But some of Arwen's Gowns are quite beautiful. I always liked this one, for the brief 4 seconds you see it, before she changes back into her Elvish Business Suit (Chase Dress). But I thought it looked too much like a maternity dress. Then I got pregnant, and now I'm "It looks like a maternity dress!" I want to combine it with her "Rose Dress" (cut from the movie), which also has a split overskirt, but a (removable?) waistband as well. I think the waistband gives much better lines. This is my first installment of "Everyday Lord of the Rings Wardrobe" in other words, stuff I can actually wear to more places than Ring/Costume/Dragon/etc Con. Because it seems like such a rum pity to spend so much time making something beautiful, and only get to wear it 4x in your life (not counting photoshoots), and have it hang in your closet while you have to wear jeans and t shirts and modern stylish clothes you don't really love. Yeah. So. Epic and Wearable. 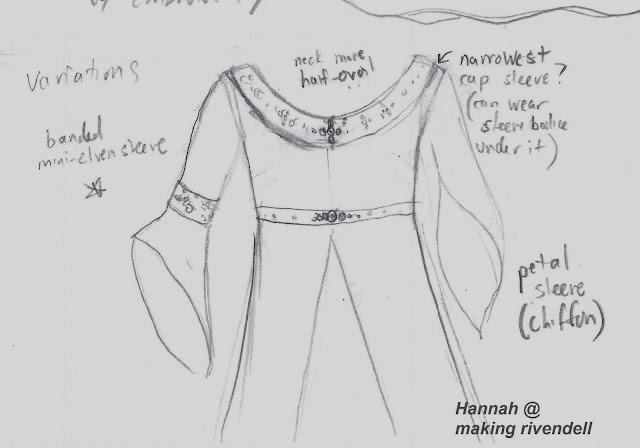 Onto Arwen's Angel Dress. I drew sketches until I had down the elements that I really liked from this dress. I really like the deep scooping beaded neckline, the empire waistband (Rose Dress), the split overskirt, and the angel-like sleeves. From a practical perspective, I can think of 2 ways of making the skirt. Either, I can make an underskirt with a split overskirt over it, like the original. OR I can put a bit inverse-box pleat in middle of a single skirt, and top stitch the edges of the pleat (perhaps with embroidery) to hold it into that shape. 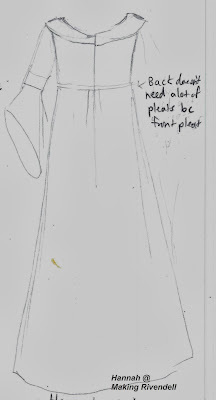 Either way, the skirts will be A line, cut with a rather large top to bottom ratio to give a lot of fullness in the hem. And I'm going to hem-stiffen it, to make the skirt stand out a little without the need for petticoats. The bodice will be a simple empire design, fitted with darts, with a deep scoopy yoke at the top, which I will bead and embroider to my liking. Also, I tried out different sleeve looks, and while I love all 3 (angel, petal, and banded mini-tippetted sleeves), I think I like the banded mini-tippetted ones best. Kind of mini version of elf sleeves. For practical (and financial) reasons, I shall make it out of cotton. Also, I have no experience with knits. So while the original was some kind of knit, this one will be made from regular woven cotton. 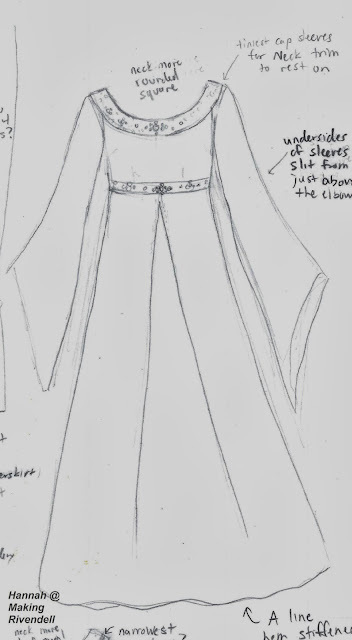 If I do the angel sleeves, I think I'll make them out of polyester (non shiny!) chiffon, attached to a removable underbodice, so I can wear the dress without sleeves, and handwash the chiffon separately. The Back: zipper closure. 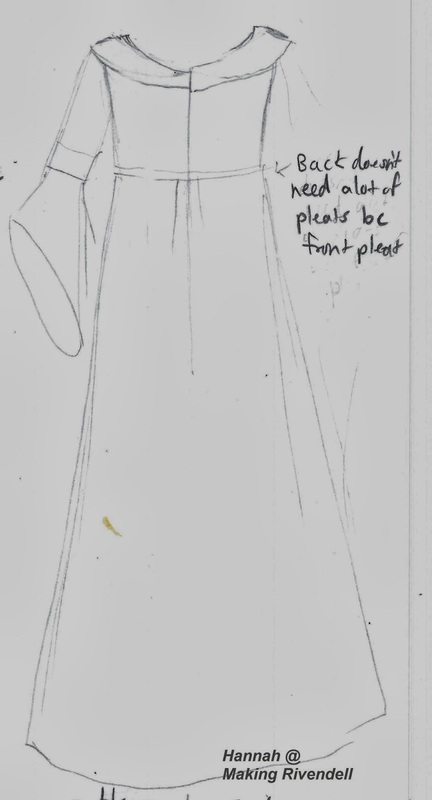 I don't have to put a lot of fullness in the back, because the front box pleat (or under/overskirt) will accomodate my growing belly just fine. I'll either split the front yoke (Option B), and have a seam going down the front bodice, closed with either hook n eyes, or an invisible zipper. I think an invisible zipper would be more practical, as screamingly hungry babies don't want to wait 2 minutes while you get all the hooks...we'll see. OR I could keep the front yoke unbroken (Option A), and have the dress only sewn to it at the shoulders, and snapping underneath it when shut. 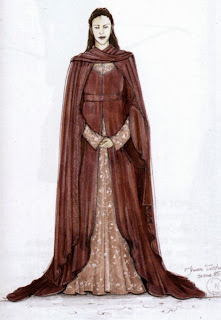 More Elven Cloaks: Tips and Tutorial How to Sew a Lord of the Rings Half Circle Cloak. Mommy to 6 of the cutest children ever, married since July 2010 to the Awesomest Husband in the World (he has a medal to prove it) :) Third of 9 children, Homeschool Alum, graduated UPenn May 2010 with Physics and Jewish Studies Majors. I love the Middle Ages, the Lord of the Rings, the Ballad of the White Horse, and epic things that make me cry (in a good way). 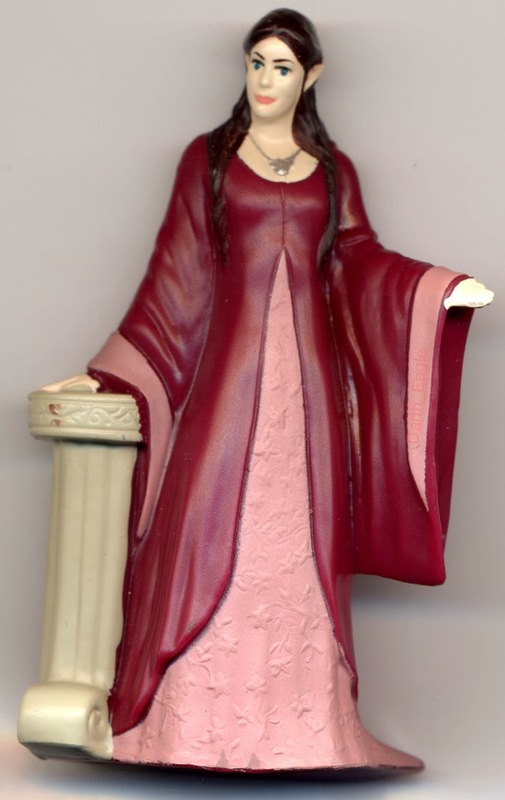 Other information: Chava's daughter, born under Adam's curse, ransomed by the blood of the Anointed One, Jesus of Nazareth. He has carried me on His strong shoulders through darkness, and I have seen the rivers of his blood soak the parched ground--and the curse of Adam broken. I have seen him standing by the Bright River,saying "Come"
Of Cars in your Toes, and Climbing Chairs.